Emmanuel HUSSENET, Journalist & Adventurer: La COP21 à Paris pourrait-elle changer le monde ? Face à un enjeu universel, les limites du pouvoir politique ? 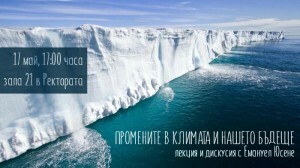 Within the framework of the project “Enabling students and citizens to realize their global environmental and social footprint” (CEE Bankwatch Network (No 681/15), in May 2016, Shtastlivetsa Association invited the French polar explorer, journalist and writer Emmanuel Hussenet from the organisation “Robinsons of Ice” to Bulgaria. Since his youth, Mr. Hussenet has been familiar with the polar ice sheet problems caused by climate change. 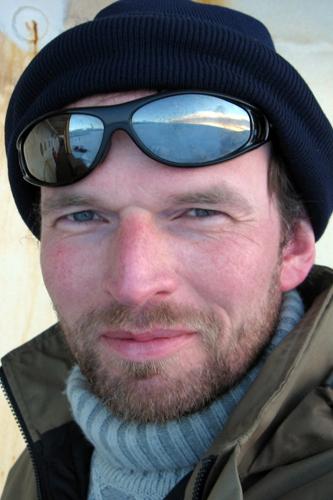 In the past few years, Emmanuel Hussenet had embarked on an international political initiative to declare the disappearing island Hans in the northern polar circle as an international zone, a symbol of awareness of developmental impacts caused by the global climate change. Those who are nicknamed the Robinsons on Ice or the voluntary shipwrecked men are in fact called Emmanuel HUSSENET (Expedition Leader, Journalist & Adventurer), Luc Dénoyer (Logistics, Photographer), Anne Quéméré (Scientific Reports) and Gauthier Mesnil-Blanc (illustrations). Hussenet has just set up a programme that will proceed over five years. Its objective is to testify to the evolution of the polar icecap. The programme is articulated around three axes: sporting adventure, scientific study and environmental teaching. On May 16, 2016, the project team organised and held a seminar with international participation “Can the climate conference in Paris change the world ? : Is the global political system able to cope with a planetary problem?” (Aka La COP21 à Paris pourrait-elle changer le monde? À à un enjeu universel, les limites du pouvoir politique?) at the French Cultural Institute in Sofia. Emmanuel HUSSENET, French writer, journalist and researcher of the Far North, Georgi STEFANOV, Climate Coalition – Bulgaria and WWF-Bulgaria, Gennady Kondarev, Ecological Association “Za Zamyata/For the Earth”, participated in the discussion, led by Dr. Radosveta KRASTANOVA, New Bulgarian University and Educational Network PLACE OF FUTURE. The problems that the melting of ice on the poles caused greatly impressed the participants in the discussion. The question of whether the decisions of the COP21 Climate Conference in Paris will lead to effective policies provokes a lively debate between the representatives of various academic and scientific institutions, civic initiatives and NGOs, students and lecturers from different universities (New Bulgarian University, Sofia University St. Kliment Ohridski, University of Library and Information Technology, etc. ), journalists, politicians and diplomats. (Nouvelle université bulgare et Réseau éducationnel PLACE FOR FUTURE). Emmanuel HUSSENET, French writer, journalist and researcher of the Far North, Georgi STEFANOV, Climate Coalition – Bulgaria and WWF-Bulgaria, Gennady Kondarev, Ecological Association “Za Zamyata/For the Earth”, participated in the discussion, led by Dr. Radosveta KRASTANOVA, New Bulgarian University and Educational Network PLACE OF FUTURE. The problems that the melting of ice on the poles caused greatly impressed the participants in the discussion. The question of whether the decisions of the COP21 Climate Conference in Paris will lead to effective policies provokes a lively debate. Representatives of various academic and scientific institutions, civic initiatives and NGOs, students and lecturers from different universities (New Bulgarian University, Sofia University St. Kliment Ohridski, University of Library and Information Technology, etc. ), journalists, Politicians and diplomats. On 17 May 2016 the team of SCA-Shtastlivetsa organised a discussion with the French polar researcher Emmanuel Hussenet in the Alma Mater of Sofia University “St. Kliment Ohridski “. Co-organizers and participants in the discussion were Ecoclub “UNECO” at Sofia University “St. Kliment Ohridski “,” S.K.O.R.E.T.S. Club” at Sofia University” St. Kliment Ohridski “, Environmental Association” For the Earth “, Educational Network” PLACE OF FUTURE “. The melting of the glaciers, as well as the problems they led, excited the participants in the seminar. The students were most impressed by Mr. Hussenet’s initiative to make the polar island Hans an international area, and that provoked many questions and a lively discussion. The two debates are carried out with the financial support of the European Union. The content of the debates is entirely the responsibility of Shtatslivetsa Sofia Civic Association, Enironmental Association “Za Zemyata/For the Earth” and PLACE FOR FUTURE Educational Network and in no way can it be considered to reflect the positions of the European Union. This entry was posted in - Civic Forum, EDUCATION :, - Алтернативна култура, - Грижа за Земята, - for download, 1. VIDEO Chronics :, 3. TEXT :, SUPPORT NOW :, LEARN MORE ABOUT :, Ново ! on %A %B %e%q, %Y by Petar Kanev.